Wolf 453 crouches on the northern edge of Slough Creek, its gaze fixed on breakfast. The cow elk stares back. The gray wolf rises and lopes toward the elk, which lies in the early-morning sunlight a few hundred yards uphill. The elk stands abruptly and, for a moment, looks ready to hold its ground. But when 453, trailed by a younger packmate, gains speed and resolve, the elk sprints off, racing along the creek through sagebrush and patchy snow. On a low rise to the southeast, a small battalion of park biologists and visitors hurriedly raise their binoculars and bend to their spotting scopes. "Looks like food," one visitor murmurs, searching the distance with bloodthirsty concentration. But the elk and the two wolves disappear behind a knob, and the observers sigh. Just a few minutes later, the wolves saunter back into sight. "Nope," surmises Emily Almberg, a young park volunteer who has been observing the Yellowstone wolves for the past year and a half. If the wolves had made their kill, she explains, "we’d probably be able to see blood on their muzzles. It usually gets pretty gory." Maybe the wolves were too slow, still sated by the kill their pack made yesterday. Or maybe they needed help from an absent hunting companion: winter. Winter typically starves and weakens the animals wolves prey on, and foils their escape with sheets of ice and soft, heavy snowdrifts. But this year in Yellowstone, the season rarely showed up. This year, winter went south with the snowbirds. It turned up in Southern California, where it unmoored hillsides and terrified coastal dwellers. It parked itself in the heart of Death Valley National Park, where nearly six and a half inches of rain — the most received in a single winter in recorded history — covered the lowest point in the Western Hemisphere with a waist-deep lake. Kayakers, canoeists, and even a kiteboarder plied the briny whitecaps for weeks. "When you’re out there in the middle of the water," says park ranger and sometime kayaker Charlie Callagan, "it just seems to go on, and on, and on forever." Winter also pounded most of the Southwest with a series of fat, wet storms, bringing forth the best wildflower shows in recent memory. Even parts of Colorado and Utah enjoyed well-above-average snowfall, and Utah ski resorts drew record numbers of visitors. But in the upper reaches of the West, in Washington and Oregon and large sections of the Northern Rockies, winter was distressingly fickle, showing up much too late and staying all too briefly. Winter is an expected part of life in cold country, part of the economy, the ecology, and a thousand humdrum annual rhythms. It is the builder of Ski Country USA, the filler of reservoirs and canals and wild rivers. It is the dark, quiet side of the calendar, the seemingly inexorable season, the gray months that burnish the pleasures of spring. Can we still count on it? Kelly Redmond grew up with weather on his mind. He was raised in the small farming town of Belgrade, in southwestern Montana, and his father, who worked for the Federal Aviation Administration, made hourly weather observations at the Bozeman airport for nearly three decades. Today, Redmond is the deputy director and regional climatologist for the Western Regional Climate Center in Reno, Nev. He’s spent the last few months tracking a season that he describes, with the enthusiasm of a veteran weather hound, as "astonishing." The Pacific Northwest and the Northern Rockies did get some moisture in the late fall — what Redmond refers to as the "preboarding" period — but above-average temperatures helped keep the snowpack at modest levels. A few remarkably warm spells in midwinter, combined with a persistent lack of snow, all but finished off the season: By late January, even terminally optimistic ski resorts in Washington and Oregon were unable to put a cheerful spin on the situation, with one reporting "lots of dirt." Ski Bowl, one of the five ski resorts on Mount Hood near Portland, had its shortest season in more than 50 years, with lifts running for only three weeks. Mount Hood Meadows, about 2,000 vertical feet above Ski Bowl, closed for nearly a month in midwinter, forcing many of its employees to find more reliable jobs. 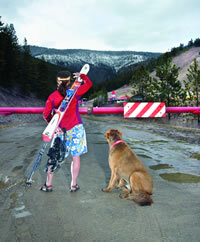 Some ski areas in the inland Northwest fared somewhat better, but many still struggled to stay open. The Race to the Sky, a 350-mile sled dog race usually held in Lincoln, Mont., in mid-February, was cancelled for the first time in its 20-year history. "We just ran out of snow," says organizer Jack Beckstrom. "There was so much bare ground at lower elevations that there was no way to string together 350 miles of trails." The highest stretch of the North Cascades Highway, which slices across the waist of North Cascades National Park, is usually buried in snow until around May 1. This year, it opened on March 10. Jeff Adamson of the Washington State Department of Transportation says highway crews sometimes spend eight weeks clearing the 36 miles of snow-covered road. The work this year took only 10 days. "Usually, crews are up there with avalanche beacons on, monitoring the hillside above," says Adamson. "This year, they were working in T-shirts." Then, in late March, winter finally blew into the Northwest, burying parts of the Cascade Range of western Washington and Oregon under several feet of snow. The North Cascades Highway shut down for nine days, and road crews donned their little-used parkas to clear off some five and a half feet of late-winter snow. The Summit at Snoqualmie, a ski area in the Cascades east of Seattle, reopened for April Fool’s Day and the following weekend: "It’s no joke!" its Web site giddily advised patrons. "Time to rally!" But the late-season excitement did little to change the final score. "It was too little, too late," says Redmond. On March 31, the federal Natural Resources Conservation Service reported that, although the tardy storm pumped up snowpacks by 5 percent to 10 percent in most Pacific Northwest river basins, the long-lasting dry, warm weather still left snowpack in the region significantly below normal. In the Cascades, snowpack clocked in at 22 percent to 45 percent of average, with many of the service’s snow-measurement sites posting record lows. Central Idaho and western Montana reported snowpacks between 50 percent and 70 percent of average, also some of the lowest on record. Meanwhile, overall spring snowpack in Colorado exceeded average for the first time in seven years, and, thanks to a series of monster storms, snowpacks in southern Utah ranged from 140 percent to 240 percent of average at the end of March. Southern Utah saw record-setting snowpacks in 1983 and 1993, says NRCS Utah snow survey supervisor Randy Julander, and "we’re within just a whisker — a tenth of an inch — of exceeding those two record years." At high elevations, Julander says, some snow-measurement sites are so far beyond all previous records that "it isn’t even funny." Why all the weather weirdness? Climatologists admit they’re a bit stumped. Kelly Redmond says the winter of 1940-’41, which was also extremely dry and warm in the north and wet and cool in the south, offers the closest historical comparison to this winter. But the winter weather 64 years ago was driven by a very strong El Niño, a pocket of unusually warm ocean-surface temperatures in the equatorial Pacific. This year, what Redmond calls a "weak, mild-mannered" El Niño hovered on the international dateline, as far from the Pacific Coast as an El Niño gets. "We’ve only seen three or four in the last century or so that have been that far west," he says. What’s more, Redmond explains, the movements of air around the globe that delivered the odd weather didn’t look anything like typical El Niño-inspired circulation patterns. This mismatch, he says, "has been a major puzzle." It is possible that the insulating cloak of carbon dioxide and other greenhouse gases around the planet — steadily thickened in recent decades by cars, coal-burning factories and other human creations — is heating the oceans in unexpected ways. These warmer seas might, in turn, be contorting atmospheric circulation patterns, creating bizarre weather extremes. But these potential links, though tantalizing, remain poorly understood. What is well understood is that increases in greenhouse gases are largely responsible for warming up the planet as a whole. The Intergovernmental Panel on Climate Change, considered the international authority on climate science, reported in its most recent assessment that global average surface temperature rose about 1 degree Fahrenheit during the 20th century. In the Western Hemisphere, this warming was greater than in any other century for the last 1,000 years, and the 1990s were the warmest decade of the millennium (HCN, 1/24/05: Written in the Rings). The panel also stated that the concentration of carbon dioxide in the atmosphere increased by 30 percent over the past 250 years, and announced that the current rate of increase is unprecedented in the last 20,000 years. "There is new and stronger evidence that most of the warming observed over the last 50 years is attributable to human activities," the panel wrote. Though it might sound as if the planet is heating evenly, like a chicken on a rotisserie grill, temperature gains are most dramatic during wintertime, at high latitudes, and in the mountains — times and places usually distinguished by reflective layers of snow and ice. When higher air temperatures melt snow and expose bare ground, the ground absorbs more solar radiation and melts yet more snow. This feedback effect creates greater surface-temperature increases in snowy regions than in areas where there isn’t usually any snow. Rising global temperatures are almost certainly causing trouble in Western snow country, says Philip Mote, climatologist for the state of Washington and a researcher with the University of Washington Climate Impacts Group. Mote reports in a series of recent studies that spring snowpack in the Pacific Northwest — and the West as a whole — has been declining in volume, and melting earlier, for more than 50 years. The amount of snow left in Western mountains on April 1 has shrunk an average of 11 percent since 1950, Mote and his colleagues found. The collapse is particularly dramatic in the Cascade Range of western Washington and Oregon, where many places witnessed a 50 percent decline in April 1 snowpack over the last half-century; in some spots, the spring snowpack completely disappeared. At very high elevations, where temperatures are often far below freezing, small amounts of warming don’t have much of an impact on the snowpack. But closer to snowline, where a minor change in temperature can make the difference between a blizzard and a rainstorm — or between the snowpack staying put and melting off — the effect of temperature is so powerful that it can overwhelm even significant increases in snow and rainfall. In the low-slung Cascades, for instance, computer simulations show that spring snowpack declined between 1916 and 2003 — in spite of widespread gains in winter precipitation. Could the warming observed in the West be explained by a natural shift in the climate, as some critics suggest? Not likely, says Mote. "We’re tampering with the energy balance of the planet in a way that leads us to expect warming, and we’re getting warming — there’s no dispute about that," he says. "On the scale of the Western mountains, we can’t say unequivocally that the warming is because of greenhouse-gas emissions, but no known pattern of climate variability comes close to explaining it." Less snow for less time means that streams are filling earlier in the year, and drying out more quickly in the summer. Researchers at the Scripps Institution of Oceanography in La Jolla, Calif., found that the timing of snowmelt runoff in many Western rivers gradually advanced 10 to 30 days between 1948 and 2000. As in the University of Washington studies, some of the most significant changes show up in the lower-elevation mountains of the Pacific Northwest. If we continue to pour greenhouse gases into the atmosphere at the current rate, the Scripps scientists anticipate that runoff timing in many areas will advance another month by the end of the century. So if Mote and his fellow researchers are right, rising temperatures are whittling away at winter, and will continue to do so. Even if global warming leads to more precipitation in some places, the overall area covered in snow will shrink, and remain buried for less time. Mote, who has a refreshing knack for clarity, summed up his findings at a recent conference of Western climate scientists in southwestern Montana. "We don’t know where precipitation is headed, but temperatures are going up," he said. "The dominant influence on snowmelt hydrology is temperature — so we’re in trouble." Let’s be as clear as a melting icicle: There’s no way to know if this winter’s strange behaviors — its flirtations with the north, its overenthusiasm in the south — are bona fide symptoms of global warming. "Just on the basis of this exceptionally sunny and dry winter (in the Northwest), I wouldn’t want to say ‘Hey, sell your skis and get some beach chairs,’ " says Mote. But if current research holds up, we can expect winter to continue its long fade. And we can, for the most part, blame ourselves and our fellow humans. "What’s really striking this year is how far up the mountains the bare spots go," says Mote. "That is a glimpse into the future." Such a future has, to say the least, serious implications. "The importance of snowpack to life in and around the Rocky Mountains cannot be overemphasized," stated a 2003 regional assessment conducted, at the behest of Congress, for the U.S. Global Change Research Program. Permanent changes to the depth and lifespan of snowpack, or to the timing and volume of streamflow, the report said, would "affect every aspect of the Rocky Mountains and much of the regions surrounding them." 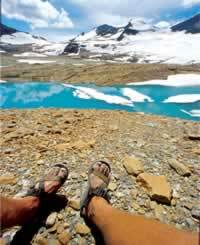 Every aspect: Think water and winter travel, wildfires and wildflowers, pollination and hibernation. Consider Wolf 453, the Yellowstone wolf that missed an elk early last month. Its pack, the Slough Creek Pack, seems to be doing just fine this year, with a typical number of elk killed. But an analysis published this month reports that late-winter snow depth in northern Yellowstone has decreased significantly over the past 55 years, as has the duration of snow cover. The reasons, as always, are complex, but temperature appears to play a definite role: Temperatures in late winter have increased markedly, multiplying the number of winter days when the mercury rises above freezing. Wolf 453 must have noticed. "Wolves can’t kill any animal they want to," says Douglas Smith, the leader of the Yellowstone wolf project. "They have to be opportunists, and opportunity comes in many different forms. Perhaps the biggest one is snow." Several studies show that wolves are more successful killers when the snow is deep enough to bury elk forage and trip up prey, and Smith says preliminary data from Yellowstone support these findings. Wolf kill rates during the past five years have been roughly 35 percent to 40 percent lower than during the wolves’ first five years in the park, and Smith attributes the change to the recent drought. "Without deep snow," he says, "the elk have been outrunning the wolves." If winter continues to slip away — and if the connection between snow and wolf kills proves to be as tight as researchers suggest — more elk are likely to escape Wolf 453 and its packmates in years to come. What might this frustration at the top of the food chain mean for Yellowstone? Wolves are probably going to turn up something to eat: "They can deal with almost everything that gets thrown at them, so they’ll figure it out," says Smith. But other species may not be so adaptable. Grizzly bears, for instance, often depend on the fatty seeds of the high-elevation whitebark pine to get them through the fall and early spring. If, as several researchers predict, the combination of warming global temperatures and bark beetle invasions eventually erases whitebark pine stands, grizzlies may increasingly rely on wolf kills for sustenance (HCN, 7/19/04: Global Warming's Unlikely Harbingers). When the whitebark cone crop in Yellowstone happened to fail recently, Smith reports, "we saw more bears on wolf kills than in any other fall." So bears may count on wolves to help them weather the effects of global warming. Yet if Wolf 453 and its companions can’t kill as many elk, the grizzlies might find fewer, or less nutritious, kills to poach. It’s impossible to predict exactly how the intertwined relationships among snow, wolves, elk and bears would change in a warmer, less wintry future. But it’s safe to assume, as Smith says, that "all of this stuff is going to ripple through the system" (HCN, 3/31/03: Tinkering with Nature). During the conference of climate scientists in southwestern Montana in March, a group of managers from Yellowstone and elsewhere gathered to consider the wide-ranging implications of declining snowpack, earlier snowmelt, and the dry summers that follow. They foresaw, among other changes, more and bigger fires in the park, higher stream temperatures, more tenacious invasions of exotic species, and an increase in visitors during an unnaturally extended summer season. These were merely raised as possibilities, but the park already has some firsthand experience to draw from. Yellowstone is now in its sixth year of serious drought, says Tom Olliff, chief of the park’s natural resources branch, and "we’re seeing things that the current crop of managers hasn’t seen before." The drought is a particular strain on the Yellowstone cutthroat trout, already decimated by a decade of attacks from the exotic and predatory lake trout. Whirling disease, which deforms and kills young trout, spreads more quickly in warmer, shallower streams. What’s more, some smaller streams lose so much momentum during the summer that they no longer flow into Yellowstone Lake, leaving native fish and fry marooned upstream. And since the Yellowstone Plateau holds the headwaters of both the Snake River and the Yellowstone River, the fate of the creeks and streams here can reverberate on both sides of the Continental Divide. Whether or not human-fueled global warming is driving the present drought, the extreme weather "has helped us focus our thoughts," says Olliff. "If this is our future, what are the ecological changes we can expect? How will Yellowstone look in 25 years?" To answer those questions, Olliff and other managers will be watching the park more closely. The Greater Yellowstone Network Inventory and Monitoring program, part of a Park Service-wide research effort, recently identified climate as one of a dozen "vital signs" in Yellowstone and nearby parks. The program has proposed to collect more extensive climate data at higher elevations in the parks, and to make existing data more widely available to managers and researchers. Such information could help illuminate the effects of climate changes on animal behavior, geysers and hot springs, and patterns of natural disturbance. Park staff, alone, can’t answer the big questions about why the climate is changing in Yellowstone. They can provide a record of the consequences. As winter threatens to exit the room, can we, as Westerners, do anything other than watch? We’re facing a huge problem, trouble on an almost unbelievable, pull-the-covers-over-your-head scale. But perhaps inspiration for action can be found in Yellowstone itself. Ten years ago, after years of work by agency scientists and park officials and armies of environmentalists, gray wolves were returned to Yellowstone National Park and other parts of the Northern Rockies. This was, of course, an extraordinarily controversial project, buoyed by a sympathetic administration in Washington, D.C. But it was also sustained by an enormous, and genuine, cultural shift. By the time the first wolves were released in 1995, the animals were no longer pests to be exterminated, as they had been mere decades earlier. To many in the United States, they had become an acknowledged part of natural systems, and they were, when and where possible, to be returned to their former habitats. Wolf 453 and its brethren were born and bred in the wild, and the seven wolf packs that roam the famous Northern Range of Yellowstone are now a very real part of life in the park. (Just ask that out-of-breath elk.) For many people in the West and elsewhere, the Yellowstone wolves are also symbolic. They stand for the possibility of restoration. They encourage us to believe that, despite everything, humans are capable of making major repairs to the natural world. Yet even as we were returning wolves to the core of the West, it seems we were busy warming up the planet, and quite possibly undercutting the nature of Yellowstone itself. Without a change of course, we’re likely to continue our slow sabotage of winter. In the process, we could very well unravel our ski vacations, our river trips, and our water supply, not to mention one of our most profound acts of ecological restoration. So to protect the park that now harbors the wolves, and the hard work that brought the wolves back in the first place, yet another cultural shift is required. Collective commitments to change, even with the support of the powers that be, are rare, and difficult, and almost never swift. But as Wolf 453 reminds us every morning, they are possible. University of Washington Climate Impacts Group www.cses.washington.edu/cig.